Featured are dream photos that any book lover would enjoy: books stacked, arranged and otherwise stuffed in ways that span the spectrum of book storage. Some photos show the simply utilitarian method, shelves stocked, every last inch of space taken with barely an air pocket between books. Other photos show amazing creativity, such as would make an architect sit up and take notice: books stacked in igloo-style shapes, mazes and doorway arches. I veer toward utilitarian, shelves jammed from one end to the other, though I admit I am averse to stacking books in horizontally atop the vertical ones. My bookshelves are scattered throughout my home, but my dream space is the picture I am including today. 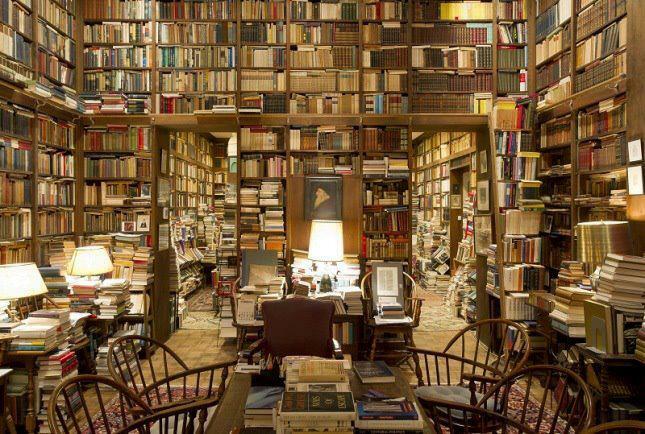 Since I do not have the space for it in my home, I use this picture as my computer’s wallpaper, and anytime I need to escape into my “ideal” book space, I just minimize my various screens and inhale the would-be scent of a whole room crammed with books. What type of book owner are you? ← Writing: the Craft? Please. I have two book shelves and they’re all for show. I’ve converted to digital. How does digital smell? I guess a lot less musty!